Having just turned five years old, I was a little young (at least back then) to question the “holiday” law-of-the-land. 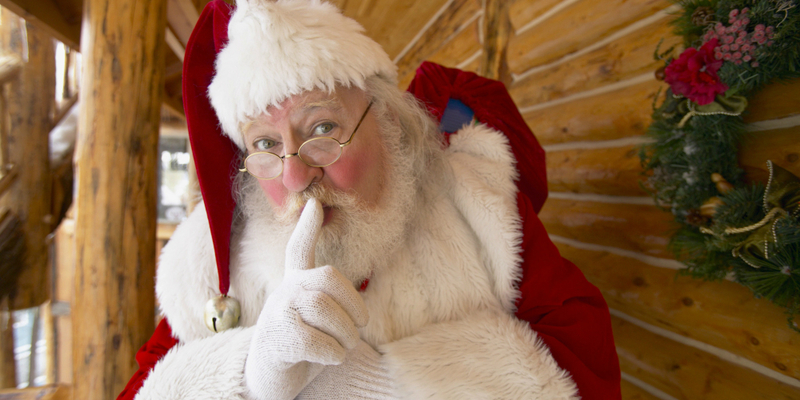 Of course five-year-olds believed in Santa Claus! But it was back in the day when several ages of neighborhood kids used to hang around together, and I was running with some seven- and eight-year-olds who were feeding me some pretty good reasons not to believe in that benign big man. Most of you are at least vaguely familiar with the various Protestant Reformation (and later secular) traditions that transformed Saint Nicholas into Santa Claus, so it is not necessary to go into those now. What I’m wondering is why many devout Christians including some Catholics, conclude that, while it’s absolutely crucial to be truthful to your children, in the case of Santa Claus, it’s perfectly acceptable to LIE. Yes, I used the word lie deliberately, rather than some double-speak like “story-telling” or even “half-truth.” For to go along with the Santa myth is not harmless fantasy; it is deliberately deceiving your children about the Good News, specifically the Salvation Story. In my case, it was not the “time factor” (all those houses in one night!) or “small chimney, big body” arguments that dissuaded me. It was because while many “good” poor kids got few, if any presents, many “bad” rich kids received more than their share—completely contrary to the basic “good kid, bad kid” theory of Santa gift distribution. Perhaps few other five-year-olds adopted my line of reasoning, but the fact remained that my devout Catholic parents were the ones who sold me on the Santa Story, and this made the discovery all the more disillusioning. For it was the first (and one of the only times) that my folks had lied to me—and once that absolute trust is lost, every parent knows how hard it is to get it back. A Santa story - When our darling daughter was about 6, she asked the big question in this form: Santa Claus isnt real is he, Dad? Direct question - direct answer... no Katie he isnt real. Mom and Dad give you the gifts. She said that's what I thought..... 10 months goes by and what does she start talking about? Going to see Santa... what will santa bring... I can't wait for Santa. Sometimes fairy tales die hard! Now a Saint Nicholas story. Bishop Nicholas attended the Council of Niacea (maybe the most important council ever). The big issue was the nature of Christ. Good St Nick was on the right team, the heretics were led by Bishop Arius (hence Arianism). The argument heated up, voices were raised and good St Nick punched Arius lights out and was promptly thrown in the hoosegow. They threw St Nick in the clink! The truth won out but the heresy lasted another 600 years....and even survives today. Met a JW lately? St Nicholas, Pray for us and send us more manly bishops like you! I totally in agreement with you, Tom. If you want your kids to believe you when you tell them about the faith, why would you want to start off by undermining your own credibility? My parents followed up with the Easter Bunny...and the tooth fairy. At the local Catholic grade school the first graders were promised a visit from "the clean desk" fairy if they did a good job cleaning up their desks on Friday afternoon. Sure enough, when they arrived Monday morning there was fairy dust and gold stars all over the place. The kids were awestruck. What else can we do to speed along their eventual apostasy? P.S. The Clean Desk Fairy? Yikes!! (I also happen to be a Scotch-Irish "Hoosier" Notre Dame fan...win one for the Gipper). I'll have to check out your book...it looks inspiring. EEEEMommy -- Thanks for your comment. I take a lot of flack for debunking the Big Guy in favor of the real St. Nick, so it's great to have a Christian Mom on my side. Whenever I think of the Scotch-Irish, I think of the movie Braveheart. I wonder if we could get William Wallace to play for Notre Dame. Hey Tom, What ever happened to John Corapi? It seems as though he disappeared. We've run into the same problem in our family. They need to know who St. Nicholas really is. His story is much more compelling than the fantasy the evil one would rather you to know about. Heh Tom ~ great article! I have often thought it a grave injustice to poor St. Nicholas that so many are unaware of his story - his generosity and concern for the poor through his gift-giving - and instead all the virtues of kindness and love he showed to the poor children is given to a mythical figure in a red suit. There is nothing of Christ in Santa Claus - but St. Nicholas's heart was filled with the love of Christ. I think a novena to St. Nicholas in honor of his living the true meaning of giving to those in need will surely help us all to become more Christ like in our gift giving ~ and less 'robotic' in our reason for giving gifts in the first place. St. Nicholas, pray for us! Well done, Tom. The trouble is convincing family members. @Anon 5:56 -- Thanks. No doubt a great topic for Christmas Eve or Christmas Day dinner -- if you don't want to be invited back next year, that is! @rockyfort -- Does that mean your children are telling their children to believe in Santa? Does the minister in your church support your view?